Wanda is a small woman who carries a large banner. It’s the banner of anti-consumption, pro-scaling-back, anti-clock-time, pro-nature-time. Though she can be categorized according to your own favorite piece of the puzzle of anti-industrial and pro-local, she can be found at so many points along the spectrum that you soon realize Wanda is a body in constant motion. I first met Wanda by one of those flukes that make life fascinating. I reviewed a book, Michelangelo in Ravensbrück: One Woman’s War Against the Nazis, by Countess Karolina Lanckoroñska, then I put the book up for sale on Amazon. When the book was purchased I was surprised to see that the buyer lived right here in Mt.. Airy, North Carolina. I recognized her name from the PBS series, called her and suggested I deliver the book in person. At that time, Harvard-grad Wanda and her (now ex-) husband Frank Levering had an office at the Mt. Airy Visitor’s Center on Main Street. Obviously as busy as two sacks full of cats, they took time to talk to me and praise my book review. Coming from a couple of pros in the writing game, it was heady stuff for a small-town gal like me. Wanda told me she was involved with Polish/American issues—she modestly didn’t mention the Amicus Poloniae (Friend of Poland) award given to her by the Polish Ambassador to the United States. Whirring in her active brain was the possibility of writing a play about the heroic Countess Karolina. Since I knew that, with Frank, she had spear-headed the Simple Living series, that they managed a large orchard just up the highway in southern Virginia, and were working on projects for the Town of Mt. Airy, I got the picture: Wanda is a human dynamo. Later I visited Wanda in her modest Mt. Airy abode, Sunflower House, where she was living with her son, their pets, and hundreds of books. 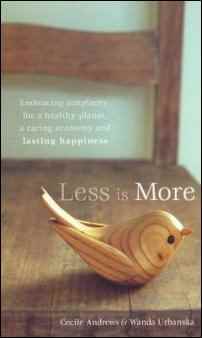 At that time she was involved with the completion of a new book, a series of green/small-is-beautiful essays titled Less Is More, co-edited with Cecile Andrews. I reviewed that book for the Winston Salem Journal. Wanda was also cultivating an urban garden and parenting her son, trying to ensure that he grows up with the values of thrift and sharing that she learned from her parents, values that helped them survive the Great Depression. 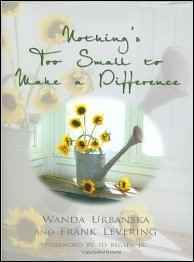 Fast-forward to early 2010, when Wanda emailed me from her father’s native village in Poland to ask that I review her newest book, an autobiographical/philosophical take on sustainability in action, The Heart of Simple Living. I got the proofs from the publisher via email and wrote yet another review for the apparently inexhaustible, globe-trekking Wanda. Now, I felt, the time had come to write about Wanda herself. Alas, when I next tracked her down, she was on her way out of “Mayberry,” so interviewing the simple-living maven would not be as simple as before. She had rented out Sunflower House and was on her way to join a new project, Builders of Hope. After a few attempts, and with the goodwill she and I share for seeing projects through, we connected for an interview. Wanda had gone from Mt. Airy to a protracted sojourn in Poland to a new career turn with Builders of Hope, in the space of little over a year. So the first question on my mind then seemed obvious: how can you maintain a semblance of simplicity when your life is so darn complicated? This is a dilemma we all face. Many of our complications are self-created, and can crop up and multiply whether we are homesteading and trying to melt into the natural cycles of time and the seasons, or up in the morning, out on the for-the-money job, working like the devil for our pay and juggling mortgage, car payments, vacations, and college for the kids. Who better to turn to than Wanda for a “simplicity solution”? Wanda acknowledged that, especially lately, her life has been, on the surface, pretty chaotic. “I’ve been living a couple of places, at my mother’s home and in Raleigh where I’m moving. That has been a challenge for me—how do you set up a simplicity regime in someone else’s home? One thing I advise people to do is create ‘good space’ for yourself—organize your bed, your personal articles, claim that space, make it yours—even when you travel you can practice space-making. Set up your schedule, your routine, to include time for physical exercise, for doing for others, for mealtimes. In my particular situation, one little thing I’ve been doing—and you know, I’ve been touring for the book as well as moving—I have a special pillow that I travel with, and there’s something very comforting about having it with me, a constant. Spiritual centering is at the heart of it—the most important. To have a belief system that is solid, no matter what is going on around you. I try to follow the principles that I give in the book, to make time for others, to avoid that superficial, frenetic feeling—it doesn’t matter if you live in a farm, or a major metropolitan area—we all experience that. Don’t text while you’re driving the tractor! Don’t listen to the iPod while you’re having dinner. Reclaim the good life. Sit down for a meal every night (or every meal) and celebrate the food, the sustenance of our lives. In the next breath, despite her busy schedule and time pressures, Wanda asked me about my tomato crop; my husband and I are urban small-scale gardeners and I’d been canning that morning. So, from talking somewhat in the abstract, we were suddenly celebrating my tomatoes! This demonstrated to me that Wanda doesn’t just say she thinks of others; she really does think of them, and includes them in her dialogue. You get the feeling that if you asked Wanda a question she didn’t know the answer to, she’d make an effort to find the answer and get right back to you. That if you told her about an aspect of her work that she hadn’t been aware of, she’d stop everything and make a note of it, and thank you for giving her a new resource. That’s her way of divesting the superficial, and reclaiming the positive. I remembered from reading The Heart of Simple Living that among Wanda’s early influences were the notable eco-heroes Helen and Scott Nearing. Wanda’s parents were non-conformists by choice, her father a Polish émigré who escaped the Nazi death list in 1939 to come to the U.S., her mother an adventuress who in her 20s worked in North Africa. Like them, the Nearings were anti-establishment intellectuals who honored physical labor. They honored it because they understood its value. Authors of the sub-culture favorite Living the Good Life, they proposed dividing the day into three blocks. A block for “bread labor” as referenced by Wanda, that is, work required to obtain the basics of life that can only be procured with cash; civic work, the community outreach that Wanda mentions so often; and professional pursuits and/or simple recreation. When Wanda speaks of “reclaiming the good life,” she is recalling the virtues of an earlier generation. She is looking back to a less complicated time—and the Nearings were, too. Wanda is carrying these values forward in her child-rearing technique, describing in The Heart of Simple Living how she has taught her son Henry to divide up his allowance, with the portion to be spent on others taking first priority. She calls it “share-save-spend”—always in that order. The same themes run through all of Urbanska’s books, including the first one written with Frank Levering, called simply, Simple Living. In The Heart of Simple Living, the credo is codified, reflected a more mature experience of enacting the ideal. Urbanska highlights seven areas for improvement and examination: financial independence, meaningful work, housing happiness, homemaking, kitchen, garden, ritual, and community living. 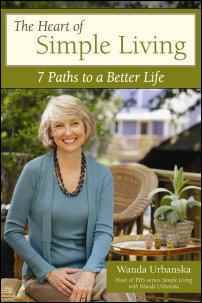 Looking at each in depth, she offers advice and wisdom based on her own experiments drawn from the many interviews she did for the PBS series, and on her life-long advocacy of the good (not the “goods”) way to contentment. Her most autobiographical book to date, The Heart of Simple Living is filled with practical suggestions on everything from organizing a yard sale, starting a backyard garden on pennies to produce pounds of edibles, home decorating with an eye to cost and ecological sensitivity as well as beauty, and case studies of people who are practicing the tenets of simplicity on a daily basis. And though we may not all feel as comfortable talking to our vitamins as Wanda does, thanking each one for its benefits, we could benefit by examining our routines, upgrading some of them to the status of precious rituals that give us a sense of timelessness and connection. It has always struck me as strange that people like Wanda are considered odd by the mainstream, that her ideas are touted on PBS and her banner carried by people in isolated pockets of society, but have yet to gain wide acceptance. What’s not to like about something as apparently innocent as simplicity? Why is there so much resistance to it? Detractors like to imply that those who espouse simplicity want everyone to turn back the clock, abandon their jobs, grow all their own food and make their own shoes. You hear homesteaders and simple living advocates called “earth muffins” and “yogurt weavers” among the friendlier terms. Less Is More is a collection of green essays meant to dispel such negative thinking. 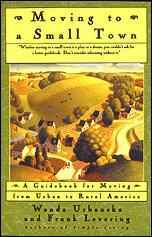 It explains how all of us can embrace simplicity even if we can’t return to Thoreau’s Walden Pond or retreat like Helen and Scott Nearing to a scaled-down homesteading lifestyle. In her chapter of that book, Wanda highlights her interview with President Jimmy Carter who said of the show’s central theme, “The message is more needed today than it was [during his term in office].” Carter urges Americans to set an example of efficiency and simplicity for the rest of the world. The project re-models houses that would otherwise face the wrecking ball, their resources of wood and brick targeted for the landfill. By restoring old homes the project is restoring old neighborhoods, with a few twists in the tale—houses will be green friendly, promising total monthly energy bills of $40. This, in turn, employs green energy workers/companies. The owners have to qualify based on income guidelines, allowing people not necessarily eligible for conventional mortgages to live in the heart of established cities like Raleigh where generally house prices are astronomical, well out of the reach of Builders of Hope applicants. Wanda’s role will be to study the project in-depth and write a book spreading the word about its successes. Builders of Hope embodies a wrap-around approach—environmental sensitivity, energy sustainability, and the practicality of low-cost alternatives. As such, it’s an obvious draw for the open, active mind of Wanda Urbanska. She, in turn, contributes her writing skills, sharing of information that goes right back to her cherished values. It’s an exchange that nestles at the heart of her ideals. Urbanska points out that in these tough economic times, even those who never gave simple living much thought have been forced to “hunker down and simplify.” Maybe the economic downturn will force a gentle U-turn for all of us. Maybe Wanda’s banner, reaching back to our better past and forward to our better future, speaks for all of us.